URGENT: OPEIU Local 2 members are fighting an anti-union contract imposed by AFL-CIO management. Click on the button to learn how you can support your brothers and sisters. Transportation: Closest metro is McPherson Square Station (Blue/Orange/Silver). Please note that there is no onsite parking. There are several nearby parking garages. We've narrowed down it down to three finalists for OPEIU Local 2's new logo. The survey closed on September 28, 2018. We'll announce the winner soon! 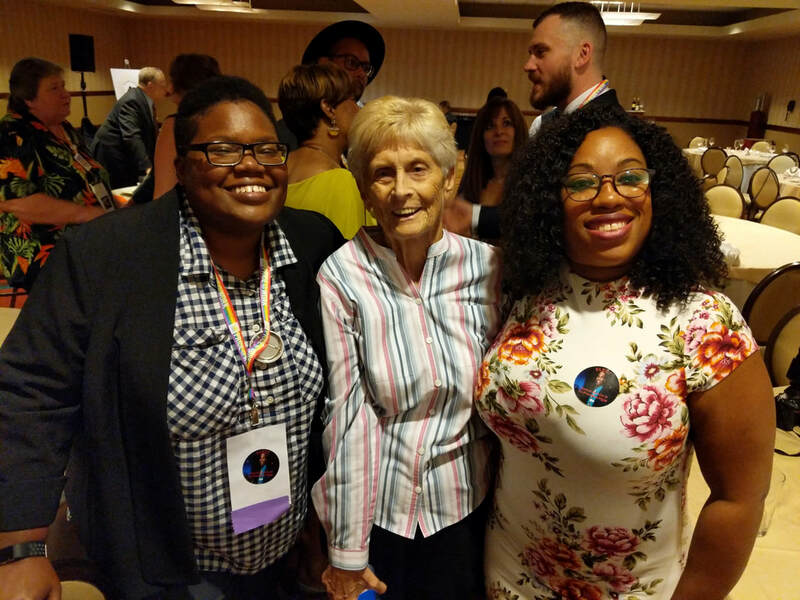 ​Pride at Work President Emerita Nancy Wohlforth, who hails from OPEIU, was honored at the Pride at Work 2018 Solidarity Awards Banquet in Phoenix, Arizona. Click here to see the video honoring her. L-R: Chelsea Bland, Nancy Wohlforth and Jorae Williams. WELCOME! ​Approximately 100 employees of NDI recently voted to join Local 2. We want to congratulate them on an extremely strong and smart campaign, welcome them to Local 2, and wish them luck in their coming negotiations for their first contract! Learn about NDI here. ​We were so happy to catch up with friends and meet new ones at our summer picnic on July 28th. We ate too much, ate some more, stayed hydrated, played volleyball, painted birdhouses, and did the Electric Slide. Thank you to all of you who made it out. For those of you who couldn’t make it: Come next time! AFGE members across the country took a stand against the union-busting, democracy-busting executive orders. In DC, AFGE members rallied outside the courthouse where their attorneys made oral arguments that afternoon. Inflation hits 6-year high, wiping out wage gains for the average American, The Washington Post. "The 2.9 percent inflation for the twelve-month period ending in June is a sign of a growing economy, but it’s also a painful development for workers, whose tepid wage gains have failed to keep pace with the rising prices." Take the pledge: Support working people's freedom! "We have never depended on any politician or judge to decide our fate and we aren’t about to start now." AFL-CIO. In 5-4 decision, Supreme Court undercuts workers’ freedom to organize, Economic Policy Institute. "Today’s decision is the result of litigation financed by a small group of foundations with ties to the largest and most powerful corporate lobbies....Today, these billionaire-backed organizations finally got their decision, succeeding in advancing an agenda that weakens the bargaining power of workers." On Friday, May 25, 2018, Donald Trump issued three executive orders (EOs) targeting the union representation and rights of federal employees in the workplace. AFGE is fighting back against these executive orders and any unlawful treatment of all federal employees. ​AFGE needs all of us ready to act as it responds to this egregious and outrageous attack. Read the Executive Orders and support AFGE to fight back here. Join your sisters and brothers at OPEIU Local 2's Quarterly Membership Meeting on July 3rd at 5:30pm at the Capital Hilton (1001 16th St, NW, Washington, DC). All OPEIU Local 2 members are invited! We are very sad to announce that our brother, Eric Starin, passed away this morning. Let us take a few moments to think about Eric's impact as longtime Chief Shop Steward at WMATA, as Executive Board Member of OPEIU Local 2, and as a lifetime fighter for workers' rights. In addition to all of these roles, Eric was our friend. ​2017 was an exciting and good year for Local 2. We are one of the few unions experiencing membership growth and financial stability. Thanks to careful attention to our spending by Secretary-Treasurer Linda Bridges, our Finance Committee and Executive Board, we ended the year 2017 with a surplus of more than $200,000. When added to the surplus from previous years, it gives us a general fund reserve balance of more than $1,000,000. Union-eligible members paying dues increased 13% from 6,937 in December 2016 to 7,862 in December 2017. Four of our staff representatives retired in 2017: Mike Cowan, George Kapanoske, Carolyn Lewis and Lou Wolf. Their skills and experience made them hard to replace. However, we believe that we have selected excellent replacements from among our membership: Michael Spiller from AFT Maryland, Rian Howard from Senior Service America, Jessica Maiorca from the Solidarity Center, and Yvonne Ellis from the National Electrical Benefit Fund. They bring to the Local a great combination of youth, energy and strong work ethics. Looking ahead, 2018 looks to be a very challenging year. The United States Supreme Court will soon decide the case known as Janus vs AFSCME, which could affect the entire labor movement. Combining this with a White House and Congress controlled by a very conservative Republican party, Labor will have to fight to survive. Local 2 has prepared with a combination of shop steward training, organizing, and improved communications with our members. Our new Education Committee Chair, Rian Howard, has prepared seven diverse shop steward trainings that began in February and continue throughout the year. To sign up, please scroll down below to Sign up for Shop Steward Trainings. Organizing Chair Michael Spiller is working on several lengthy projects, including one that recently resulted in the successful voluntary recognition of a 20-member shop. Finally, Communications Chair Jessica Maiorca restarted distribution of our e-newsletter and is working with staff to update our website to ensure that we address more items of importance to members. Local 2 has several standing committees: Communications, Community Services, Education, Finance, LGBT, Organizing, PEP, Rising Stars, Social Events, Social Justice, and Women’s. These committees are at their best when Local 2 members volunteer to serve on them. If you are interested in participating in any of these committees, give us a call at the Local 2 Office at (301) 608-8080 or email us with your name, phone number, email address, and the committee on which you wish to serve. I'll appoint you to that committee and arrange for the Chair to contact you! With the continued support of our members and the hard work and dedication of our shop stewards, I am optimistic that we will continue to grow and prosper in 2018. "No more right-to-work. It’s time to work for more!" ​J. David Cox, Sr., National President of the American Federation of Government Employees (AFGE), which is the largest union representing federal and DC government employees. Cox spoke at A Working People's Day of Action on February 24, 2018. Quote at bottom also attributed to Cox. 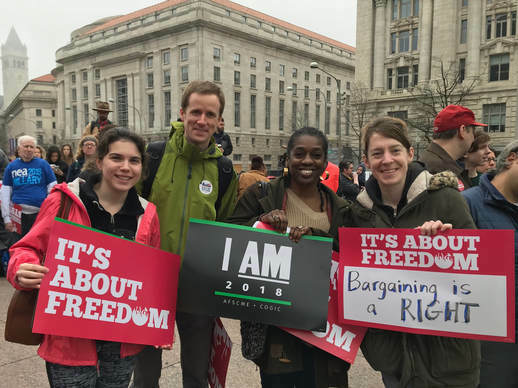 On February 24, thousands of workers rallied in cities across the US to fight for their freedom to form unions and bargain, equitable pay, affordable healthcare, quality schools, vibrant communities and a secure future for all of us. ​In DC, unions and our allies proudly gathered at Freedom Plaza in Washington, DC to show our solidarity with each other. In a few short weeks on February 26th, the US Supreme Court will hear opening arguments in Janus v. AFSCME, a case so important that we want all of our members to know what it’s about and what’s at stake. Janus v. AFSCME (the American Federation of State, County, and Municipal Employees) came about because of an employee by the name of Janus who works at the Illinois Department of Healthcare and Human Services. IDHHS is an agency shop, and employees are represented by AFSCME. Janus, who chose not to be an AFSCME union member, must pay an agency fee to the union, and he doesn’t want to. He believes that paying an agency fee to the union is a violation of his First Amendment rights. First, a few basics: In the public sector, “agency shops” are shops where every employee is represented by a union. Even if the employee is not a union member, s/he must pay an agency fee (equal to union dues) to the union as a condition of employment. The reason, in part, is that the union uses that agency fee to help pay for collective bargaining, contract administration, and grievances – which benefits all employees. If Janus wins the case, the Supreme Court could essentially find that public-sector “agency shops” are invalid under the First Amendment. Many unions believe that this will have far-reaching negative effects for public-sector and private-sector unions, with members withdrawing their support from the very unions that advocate for and defend them. Saturday, February 24: A Working People’s Day of Action, Washington, DC. Meeting place and time TBD. We’ll send out updates. Check the Local 2 website or visit here in the weeks ahead. Monday, February 26: Demonstration outside of the Supreme Court on the first day of Janus v. AFSCME arguments at the US Supreme Court, Washington, DC, time TBD. We’ll send out updates. 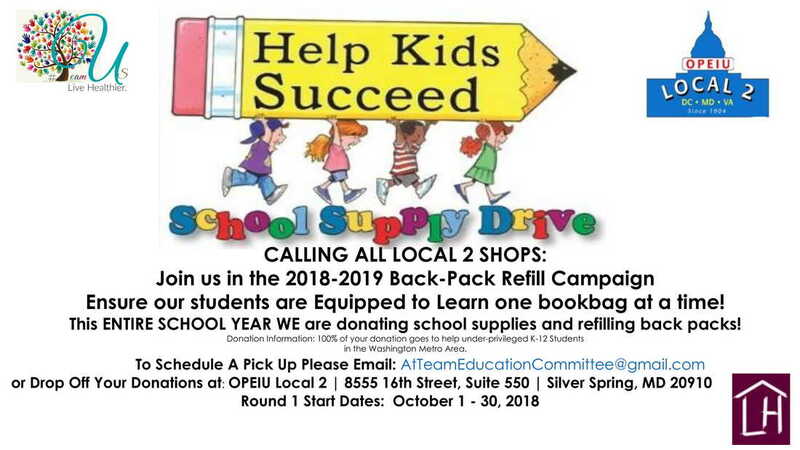 You can also check www.opeiu-local2.org. Twenty-seven OPEIU Local 2 members successfully completed a six-hour training on January 20 that strengthened their ability to defend union members facing discipline and termination as well as challenging management on unfair workplace practices and policies. “It was good to get into the details," said Saundra Fisher, Shop Steward at S&K Security Consultants. "It made me better understand the process, and now I can be more effective.” Participants – mostly OPEIU Local 2 shop stewards – ran through scenarios applying their new understanding of Weingarten Rights, past practice and just cause. Participants also dissected the grievance process with focus on interviewing and documentation, representation at the grievance hearing, and how to maneuver around difficult managements. ​In the coming year, OPEIU Local 2 will implement trainings geared towards the needs of its shop stewards who assist workers at more than 130 shops in the DC, Maryland and Virginia area. Whether you’re a new or seasoned member, these trainings will sharpen your skills. “I’ve been an active bargaining unit member for years and recently become a shop steward…I left the training feeling more confident,“ said Nalishha Mehta, Shop Steward at the Solidarity Center. Let your staff representative know if you’re interested in any of our free upcoming trainings. The 2nd Quarterly Membership Meeting will be on Tuesday, April 10, 2018 at 5:30pm. Join us! You are cordially invited to attend the Community Services Agency's 26th Annual Bowling Tournament. Proceeds benefit the CSA's mission, which is to improve the lives of workers and their families by helping to meet their human and social service needs; building broad and diverse coalitions to promote and protect dignity and justices for all workers; and empowering workers and their unions to make their communities better, more responsive places to live, work, raise a family and retire. Bring a few of your friends and coworkers and form a team! More information, including registration details, can be found here.